Alesha Dixon and Jordan Banjo are presenters on the The Greatest Dancer. 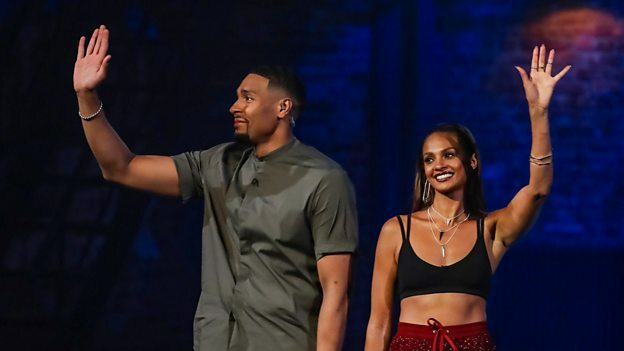 The Greatest Dancer marks singer and presenter Alesha’s return to Saturday nights on BBC One after she won Strictly Come Dancing in 2007 and went on to feature as a judge on the show between 2009 and 2011. Presenter and dancer Jordan first found fame in 2009 after his dance troupe Diversity won Britain’s Got Talent. He has subsequently gone on to present Jordan and Perri’s Ultimate Block Party and Dancing On Ice. Alesha: The contestants have to perform in the dance studio, like a regular audition, in front of a mirror and they need 75 per cent of the audience vote for the mirror to open. Once the mirror opens, hopefully they carry on dancing or they stop and they’re excited, they see their captains, they get their critique and then they’re through to the call backs. And then the captains have to whittle it down to three acts each as only nine acts can go through to the live challenge shows. The auditions stage of the show has already been filmed, but you couldn’t get involved in commenting as you have to be impartial. How was that? Jordan: We do try to get involved as much as we can and we try to sway the audience every now and then because sometimes there’s someone who’s so talented and so good and the audience don’t recognise it straight away. So sometimes it can be quite frustrating to not be able to get involved directly. Alesha: And sometimes we’re like, oh my goodness, I would love to mentor that group. Naturally as performers, we’re gravitating towards them and we’re just as invested in them as the captains, so the audience need telling off every now and then because they don’t always get it right. So the audience need telling off. Do you ever need to tell each other off? It's your first time presenting together - how’s it going? Alesha: We get on like a house on fire. Jordan: Yeah, I’ve checked for olives, I’ve checked for lipstick on the teeth. It works. What is your dance career highlight to date? Jordan: My dance career highlight is probably back in 2012, the first time Diversity sold out The O2. Alesha: Boom! That’s a really hard question to answer, but my dance highlight so far in my career would probably be getting to dance in the N.E.R.D video She Wants To Move. It was an honour to work with Hi-Hat, one of my favourite choreographers. I was super, super nervous but N.E.R.D made me feel very comfortable and I think it’s an incredible video which I’m so proud to be a part of. Alesha: I’ve got so many dance heroes, and it’s such a cliché, but how can I not say Michael Jackson? Michael Jackson, Janet Jackson, Paula Abdul, they are the people I remember when I was a little girl, watching their videos and trying to learn all the choreography. I’ve grown up with them, I feel like they’re been there throughout my whole life, and every time I do a performance or I’m thinking of doing something creative, I always think of Michael and what he would do, because he set the bar so high, he never settled for less and he inspires so many performers to always strive for more and to be better. Jordan: My dance hero is probably - he’s never going to let me live this down - my big brother Ash. Alesha: Awww I love that! Shout out to Ashley! Jordan: I think it’s purely because he’s inspired a lot of people, myself included. I always just considered us a group of mates who danced in our mum’s dance studio. He had a vision and he said to me, literally when we were kids, I promise you now I will make something big of it. And he wasn’t wrong. He did it.